LinkedIn is a valuable resource for anyone looking for a job or to expand their professional connections. But if you don’t know how to write a good LinkedIn profile, you won’t be taking full advantage of it. How do you show up in more searches? How do you show up in the right searches? And how do you get more people to take action? These LinkedIn profile tips will help you increase your LinkedIn profile views in 2018. Note that we’re going to skip the basics, like including a professional photo and making sure your information is always up-to-date, and go right to the things that make a great LinkedIn profile. There are millions of people on LinkedIn. How are you going to stand out? The answer is simple: niche down. Instead of pitching yourself as a manager, focus on presenting your profile as that of an IT manager. Or, even better, an IT manager with expertise in higher education systems. The more specific you are with what you do and what you’re looking for, the more likely you are to be found. It’s true that there will be fewer people looking at specific niches. But those people are also much more likely to want to hire (or at least get in touch with) you. This is one of the more nerve-wracking LinkedIn profile tips. But it’s recommended by countless experts who say that it will improve your search views as well as the quality of people who find you. If you want to know how to improve your LinkedIn profile in 2018, this is possibly the most important tip. A potential client, employer, or business partner isn’t interested in your skills and experience—they interested in what your skills and experience can do for them. And you need to sell that. While your LinkedIn profile does serve as a sort of online résumé, it needs to be more than that if you want to appeal to valuable contacts. It needs to use the core principles of good sales to attract views and get people interested. Possibly the most important thing to keep in mind is your customer persona. Who are you trying to attract with your LinkedIn profile? Are you looking for a job at a Fortune 500 company? Or a local startup? Do you want to be a teacher, or an airplane mechanic? And, crucially, what do they want? If you can convince them that you can provide it better than anyone else, you’ve won. The better you understand who you’re selling to with your LinkedIn profile, the more effective it will be. Keep in mind who you’re writing for and what they want, especially as you go through the next step. Once you’ve figured out who you want to see and be convinced by your LinkedIn profile, it’s time to start crafting a story. This is one of the most crucial parts of creating a great LinkedIn profile, and it’s also one of the hardest. But the science is clear: effective storytelling engages people in a way that a simple recitation of your qualifications won’t. If you can create an emotional response in your viewer, the effectiveness of your LinkedIn profile will skyrocket. What causes your potential customer or employer pain? How can you help ease that pain? What will your reader feel like once you have? If you can incorporate those three things into your summary, you’ll have a profile that stands out from the rest. Use these copywriting formulas to help create demand with your story, and your profile will become irresistible. Sophie Lizard’s LinkedIn profile is a lead-generating machine because it evokes emotion in its readers. Learning to effectively tell stories in the business world is difficult. But it can be done. I suggest reading “Storytelling That Moves People,” a great Harvard Business Review interview with Robert McKee, to get some ideas. And remember that while your summary is the main place to tell a story, you can also continue and support that story with your experience entries. This is one of the most significant omissions that people make with their LinkedIn profiles. They put out a bunch of information, and then leave it up to the reader to do something about it. It tells the people looking at my profile what they can get from me, and how they can start the process. It makes it very clear what I’m looking for. GrammarChic lists four qualities that make a great call to action: brevity, strong action words, a value proposition, and contact information. 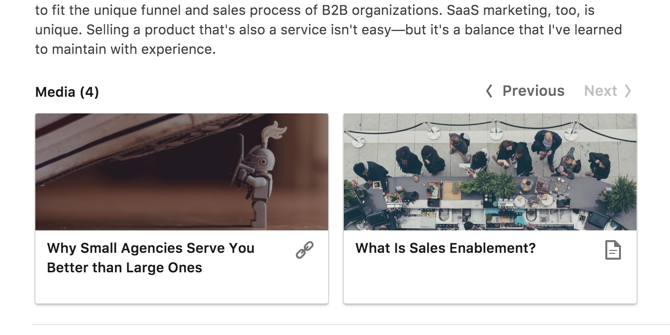 You can see some great combinations of those factors in their examples of great CTAs. You can also include these calls to action in your experience entries. Don’t overwhelm your reader with demands to connect or email you. But make sure that they never have to look very far to figure out how to get in touch. Your LinkedIn profile is largely about sharing information—which is why it’s so text-heavy. But science has repeatedly shown that people are attracted to images. Take advantage of that fact by including media throughout your profile. 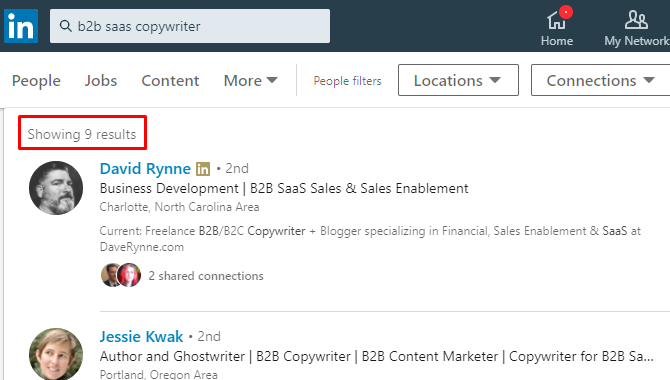 You can even publish your own content through LinkedIn. For example, you can include media in your summary and experience entries that show the kind of projects that you worked on. It could be a link to an article that you published. Or a local news story covering the work your company does. It could even be a photo of you speaking at an event. Whatever it is, it will catch people’s attention, and that’s crucial when you’re trying to boost views of your LinkedIn profile. You can upload videos too, which is a great way to start establishing a personal connection with your readers before they even get in touch. Introduction videos, clips of your presenting or giving speeches, and anything else that shows off your expertise can be useful. SlideShare has become a very popular content-sharing tool, and you can add slideshows to your profile, too. If you have a good slideshow, this is a great use for it. People obsess about keywords on LinkedIn. And one hand, it makes sense. Those keywords are how you get found. On the other, choosing the right keywords is a pretty simple exercise. If you spent some time thinking about your ideal client/employer/connection, you should have a pretty good idea of what they’re searching for. For example, if you’re looking for a management position with a non-profit organization, the people you want to connect with might be searching for “non-profit management,” “non-profit leadership,” and “fundraising,” to name a few. Want to get a job as an app developer? “Java developer,” “Java programming,” “app creation,” “app building,” “Swift development,” and similar keywords are likely to be valuable. Keep in mind that LinkedIn treats similar searches differently (“Java development” and “Java developer” return very different results). So you’ll want to include variations as well. The primary keywords you want to target should be in your headline, your position titles, summary, experience descriptions, projects, certifications, publications, and anywhere else you can put them. 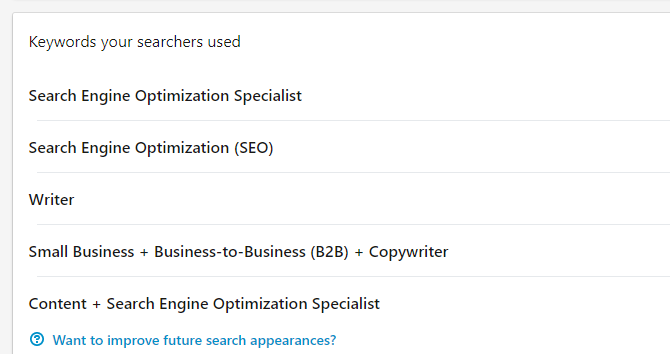 Make it very obvious to LinkedIn’s search algorithm that you qualify for the search term you’re targeting. That not only includes two more keywords, but it also gives people a better idea of what you do. This is crucial. Above all else, it’s important to use well-crafted copy that tells a story and makes an emotional connection with your reader. Stuffing a ton of keywords into your profile is going to be obvious, and doesn’t speak well for your communication skills. It’s easy to spot a profile that was written solely for LinkedIn search engine optimization. And it really turns people off. This might not fall directly under LinkedIn profile tips, but it will lead to more profile views and better search rankings. The more active you are on LinkedIn, the more you’ll improve your profile visibility, and the more likely people are to find you. Whether it’s because you’re connected to their connections, they see a comment in a group that you’re in, or you sent them a message a while back, your activity makes you stand out. You don’t need to start spending tons of time on LinkedIn. Just make a point to share useful articles related to your field, update your network on what you’re doing (professionally), comment on other people’s posts, and things like that. A great way to find awesome articles to read and share is by following great LinkedIn influencers. LinkedIn is about making connections. Sometimes those connections lead to jobs, and sometimes they don’t. But knowing more people in your field (and outside of it) is always a good thing. And the best way to connect with people is always to be helpful. Other them your expertise or to help them out with a project. That’s what really creates bonds between people, and that’s what will significantly improve the visibility of your LinkedIn profile.